Streaklet is a long exposure, light painting effect that is controlled by the Streaklet group. 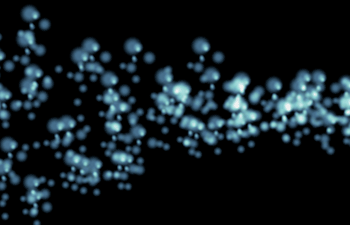 The base particle type is the Streaklet particle, which is a large particle dot surrounded by smaller particle dots. 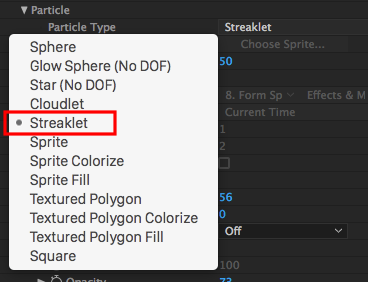 Note that the options in the Streaklet group are only available when Streaklet is chosen from the Particle Type pop-up. At left, the Streaklet group. At right, the Streaklet option in Particle Type. Random Seed: Randomizes where the small particle dots are positioned. 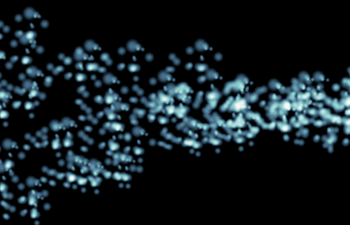 Changing the Random Seed value can quickly give a different look for the Streaklet particles. Left to right, different Random Seed values chosen. No. 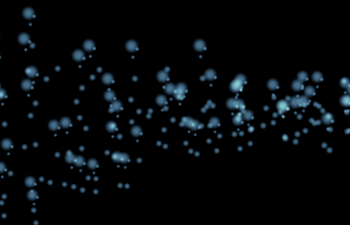 Streaks: Sets the number of smaller particle dots around the main dot. High values make more streaks, which give a more detailed look. Lower values make fewer streaks and give a more simplistic look. Left to right, No Streaks at 5 and 20. 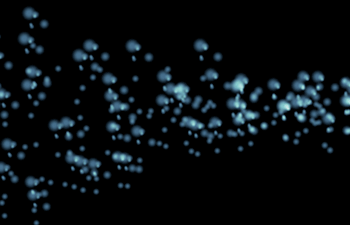 Streak Size: Controls the size of the main particle dot. Low values create thinner, more separated streaks. High values create thicker, more overlapping streaks. A value of 0 turns off the streak. Left to right, Streak Size at 30 and 50. Streaklet presets: Using the Box – Strings base form, some creativity and a little scripting, you can use Streaklets to create interesting light-filled compositions like the ones below. Several presets using the Box - Strings base form and Streaklets can be found in the Lines Presets in the Designer. 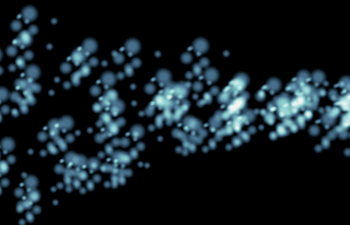 Some options using Box - Strings as a base form and Streaklet as the Particle Type.